Sri Lanka President Maithripala Sirisena sacked Prime Minister Ranil Wickremesinghe and appointed former strongman Mahinda Rajapaksa as the new premier. Sirisena’s move has triggered a constitutional crisis in the country. Sri Lanka has a semi-presidential system of government in which a president exists alongside a prime minister and a cabinet. The prime minister is responsible to the legislature of the country. Sri Lanka has an executive presidency which is more powerful than the United States presidency. Executive power lies with the president, who may summon, suspend or prorogue a legislative session. The president appoints the prime minister, the leader of the majority party in parliament. The Cabinet is appointed by the president in consultation with the prime minister. Parliament consists of 225 members elected under an electoral district based proportional representation to serve a five-year term. Of these, 196 MPs are elected from 22 electoral districts based on proportional votes, with the remaining 29 seats decided on the basis of the proportion of the national cumulative vote received by each party. Maithripala Sirisena, the current president whose broader political front United People’s Freedom Alliance withdrew from the unity government. 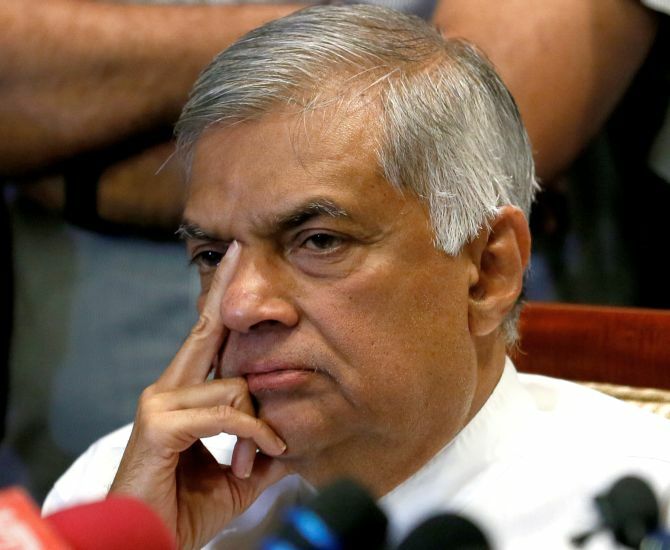 Ranil Wickremesinghe, the senior leader of the United National Party, who was sacked as the prime minister by the president last week. Mahinda Rajapaksa, the former two-time president, who was appointed as the new prime minister by the incumbent president in a dramatic move. 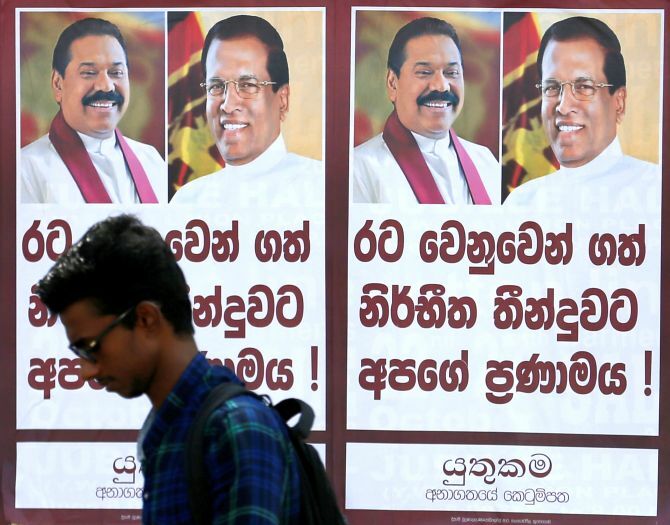 Sirisena secured a surprise victory in the presidential elections in 2015, defeating two-time president Rajapaksa. Sirisena and Wickremesinghe joined hands to form a government of national unity in 2015 to bring in constitutional and governance reforms including a new Constitution to address the long-standing issues of the Tamil minority. Sirisena had defeated Rajapaksa in the election. Sirisena on Friday sacked his ally Wickremesinghe and appointed former rival Rajapaksa as the new prime minister. Sirisena also suspended parliament till November 16 after Wickremesinghe sought an emergency session to prove his majority. Sri Lanka’s current Constitution stipulates the political system as a republic and a unitary state governed by a semi-presidential system. The system differs from India where the president is a purely ceremonial head. According to the 19th Amendment enacted in 2015, the president no longer enjoys the power to remove the prime minister at his discretion. The prime minister can only be dismissed if the Cabinet is dismissed or the prime minister resigns or the prime minister ceases to be a member of parliament. The president can remove a minister only on the advice of the prime minister. Parliament’s Speaker Karu Jayasuriya has refused to endorse Wickremesinghe’s sacking as the prime minister. In a letter, Jayasuriya questioned the president’s decision to suspend Parliament till November 16, saying it will have “serious and undesirable” consequences on the country. President Sirisena’s camp says that the Cabinet ceased to exist the moment the UPFA withdrew from the national government. When there is no Cabinet, the president has the power to appoint the person whom he thinks commands the majority in parliament as the prime minister. According to Wickemesinghe, what Sirisena did was unconstitutional because as per Article 46 (2) of the 19th Amendment of the constitution, the president cannot sack a prime minister who enjoys majority support in parliament. Wickremesinghe asserts that he has majority support in parliament. Wickremesinghe’s United National Front has 106 MPs while Rajapaksa has 95 MPs of the United Peoples’ Progressive Alliance. Rajapaksa needs 18 more MPs to give him a simple majority of 113 in the House of 225 members. Rajapaksa has already got the support of two UNP MPs on Friday – Vasantha Senanayake and Ananda Aluthgamage. Main Tamil Party Tamil National Alliance has 16 MPs and the Janatha Vimukthi PeramunaJVP, a communist and Marxist–Leninist party, has 6.